National Council for Hotel Management & Catering Technology (NCHMCT) conducts the NCHMCT JEE for those students wishes to get admission in Hotel management courses offered by the participating institutions. It is a national level entrance exam. This exam offers admission in three years of B.Sc Hospitality & Hotel management courses, National Council for Hotel Management & Catering Technology (NCHMCT). The application forms can be filled from the official website of NCHMCT. Check all the important details related to the NCHMCT JEE 2019 in the below article. The applicants should fill genuine details as required in the application form. The application form will be available from 15th January 2019. NCHMCT JEE 2019 Online Application Process will be started from 15th January 2019. Click here to apply for NCHMCT JEE. The upper age limit is 25 years for Scheduled Caste and Scheduled Tribe. The upper age limit is 22 years for General and OBC categories. This upper age limit is as on or 1st July 2019. The student should pass in 12th or its equivalent from any recognized board/university. Those appearing in 10+2 or equivalent examination can also appear. The students qualify the qualifying exam with English as one of the subjects. Students can apply offline through Demand Draft or can pay the fee through online mode using Credit/Debit Card. The Application fee is different for both online and offline mode. Exam Mode: The exam will be organized in offline mode. Number of Questions: Total 200 questions will be asked. Language: Question paper will be bilingual (English & Hindi). Marking Scheme: 1 mark will be awarded for each correct response and 25 marks will be deducted for each wrong answer. Duration of Exam: The exam duration will be 3 hours. The admit card will not be sent by post to any student. Students have to take two copy of admit card duly self-attested to submit in the examination hall. Admit card shall be downloaded from the website via online mode. Students have to download the admit card from the third week of April 2019. The Result shall be declared in the third week of May 2019 on the official website. On the basis of marks secured by the student in the entrance examination, the All India merit list will be prepared. Students will be invited according to the merit list for the counselling process. On the All India Rank (AIR) secured by the student in the written test, the admission will be provided. The counselling process will be organized in different rounds. Students have to fill their preferences of colleges for admission, in the counselling process. As per merit (AIR) and choice of Institutions filled by the students, allotment of Institutions shall be made. 10th & 12th class mark sheet & passing certificate. 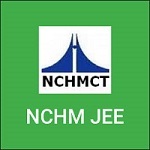 NCHMCT JEE 2019 Rank Card & Admit Card. The syllabus contains subjects such as Reasoning & Logical Deduction, Numerical Ability & Analytical Aptitude, English Language components, General Knowledge & Current Affairs. Students are advised to go through the complete syllabus prescribed for the examination. No corrections will be permitted in the application. It is a national level examination organized for admission in B.Sc Hospitality & Hotel management courses. Candidates can access the application form from the 2nd week of December 2018. You can get the application through the designated centres of NCHMCT. You can check the application fee from the above-given section of “Application Fee”. Candidate must pass 10+2 or equivalent with English one of the subjects. You can choose either of the modes, Online, or Offline for paying the fees. Students appearing in 12th examination can apply for this exam. The subject includes are shown in the exam pattern. An auto-generated application number will be given to the applicants, on successful submission of application. The applicants are advised to take down the print out of their filled in application forms. The applicants are advised to keep an additional copy of duly filled application form for future reference. Make a Study Plan: Start with understanding the exam structure followed by a self-analysis of your strengths and weaknesses. Don’t fear the Maths Section: Practice maths daily for at least half an hour and ensure that you’ve covered all the topics. Practice Regularly: It is imperative that you start practising early so that you are able to cover every topic. The identity which sections you find difficult to deal with and devote more time to strengthen them. Keep your General Knowledge Up to Date: Read newspapers daily and catch up with general guidebooks such as ‘The Manorama Guide’. Visit GK on the internet to keep a grip on your knowledge about current affairs. Understand the Aptitude for Service Sector Section: Try to analyze each and every question objectively and answer only on your personal judgements. Master your English Language Skills: Start revising all the grammar concepts, practice reading and analyzing passages, brush up your vocabulary by reading newspapers and daily articles. Past Papers and Mock Tests are your saviours: Try to attempt at least 10-15 mock tests before your exam and you’ll surely know where you stand! Keep Calm and don’t lose hope: Remain motivated at every step of your preparation and excel in your journey. Stay optimistic and you’re going to score well in NCHMCT JEE for sure.